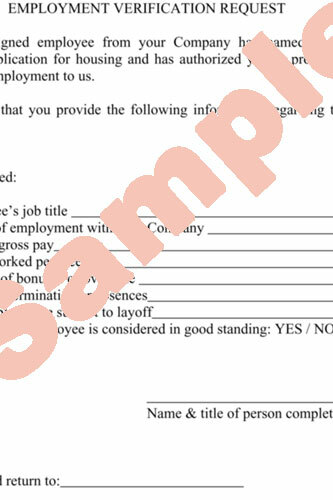 This modifiable form contract is a term employment contract that favors the employee. It provides for a term of employment, benefits, continuation of benefits, employee duties and termination, as well as provisions for benefits upon termination. This contract generally favors the employee and is essential to set forth the terms of the relationship between the employee and organization. The terms could include the duration of the job, employee responsibilities, and grounds for termination. 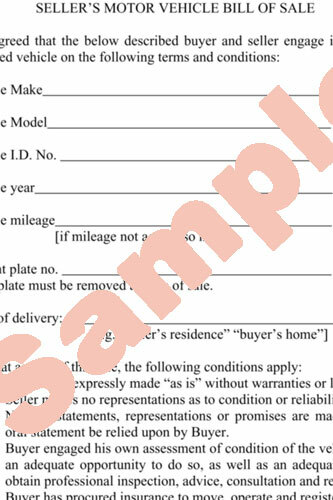 If you are selling that extra car in the driveway, maybe it's fate that you found this form. What happens when the Buyer never obtains insurance, never changes the title, get's in an accident and kills someone? What happens if the Buyer claims you misrepresented the car's condition, and sues you. In either event you will have to defend yourself in court, answer questions under oath, and incur a lot of cost, burden and expense, even if you are not at all at fault. 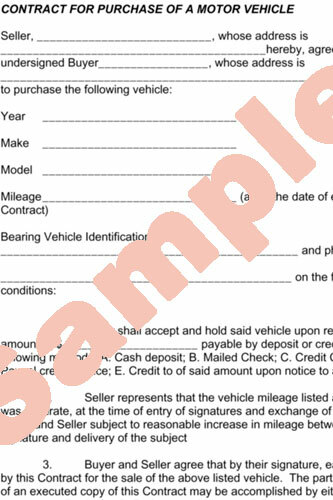 This Car Seller's Contract is designed to include protective terms in order to protect the seller if there is ever an issue. The Car Seller's Contract will explain the terms of the sale, and avoid a lawsuit. This a modifiable car buyer's contract. If your buying a used car from someone you want to be sure to evidence the identity of the parties to the contract and ensure (i) that the seller is the "lawful" seller, that the title is clear and it's not stolen; (ii) that the seller's not lying to you about everything under the sun (VIN matches car, milage accurate, bad accident, parts relpaced, used in a bank robbery -- whatever-- it's all happened before the buyer), (iii) to allow you to register the vehicle and evidence the sale. Never ever, ever, ever, buy a car without a sales contract stating what you want/need it to say. Never, ever, ever sell anything without a Bill of Sale Contract, evidencing the sale and setting out the terms of the sale. Otherwise, you have just made that sale anything but final and empowered the unscrupulous buyer to say anything, and I mean ANYTHING. That it hurt them and caused them damages, that it was the wrong one for their use, causing them damages, that you told them and promised them things you can't even imagine. Or worse, they use what they bought from you to mingle them with stolen goods and when they get caught, will say they got the stolen goods from you. Protect yourself with a written Seller's Bill of Sale for Sale of Goods so you can defend yourself and the sale if ever questioned about it. The Seller's Bill of Sale differs from the Buyer's Bill of Sale in that the Seller disclaims any promises while the Buyer's Bill of Sale warrants that all representations of the Seller about the property being sold are true. Avoid problems and use a writen BILL OF SALE for any goods you sell to anyone, every time. Never, ever, ever buy anything without a BILL OF SALE evidencing the sale and setting out the terms of the sale. Otherwise, something is VERY WRONG. Maybe the goods are stolen. Maybe they are only 1/2 the Seller's property. Maybe the property belongs to a creditor, or a creditor has a lien or interest in the property. Maybe you'll complete the sale only to have a Bankruptcy Trustee or an IRS agent call you. Unless you have a BILL OF SALE, you lose. In fact, you lose double. You lose your money, you lose your goods, and you lose them when you may be sued/charged/indicted just for becomming involved. But if you have a BILL OF SALE, you might become what the call in law a "superparty" a "Bona Fide Purchaser for Value". Protect yourself with a written SELLER'S BILL OF SALE FOR SALE OF GOODS so you can defend yourself and the sale if ever questioned about it. The SELLER'S BILL OF SALE differs from the BUYER'S BILL OF SALE in that the Seller disclaims any promises while the BUYER'S BILL OF SALE warrants that all representations of the Seller about the property being sold are true. Avoid problems and use a writen BILL OF SALE for any goods you sell to anyone, every time. STOP. That guy you hired to cut your lawn, cut down that tree. Never let anyone work on your house without an express contract -- Unless you're willing to pay an injured worker's compensation for an extensive period if/when they get injured. Be sure to get a clear understanding, signed contract, insurance, no fixed hours, and assurances. This is a modifiable form that could save you thousands of dollars when that tree cutter, handyman, roofer, lawn cutter, electrician, etc. performs work on your house. Use a written contract or be prepared to get sued and defend a lawsuit to determine whether that worker was an "independent contractor" or your "employee" and pay $$$$ (even if it's just to defend it) if/when that worker gets hurt. Smart people get these things in writing first. Property Improvement Contractors perform Kitchen, Bathroom, Basement remodeling and improvement. A writing should be used after a deal between a property owner and a contractor detailing the exact work and exact materials to be performed, purchased, and the contractor paid with "lien waivers" provided by the contractor after the work is performed and the contractor is fully paid. A license is usually required in most states to perform certain types of work, including HVAC, plumbing and electrical and most work that requires a permit by local ordinances. Contractors should be careful to properly estimate all jobs, carefully lay out and enforce payment terms, be familiar with applicable lien practice, and provide lien waivers from all subcontractors when the job is done. This basic contract is fully modifiable for the terms of any construction/property improvement contract. Musicians, Performers, Comedians, Dancers... Never, ever agree to perform without a written contract spelling out the terms of the arrangement. Otherwise you could not get paid, have a dispute about what is included, or lose future bookings and money. This modifiable Entertainer Contract includes terms of what is and is not supplied by the venue and what is and is not expected of the performer. It also contains terms for the parties to set forth the payment time, method and amount. This contract is essential to the arrangements of each party in the relationship, so there is no misunderstanding or miscommunication in the deal. This fully modifiable Venue Contract favors the Agency or Venue hiring the Performer, while the Entertainer Contract favors the Performer(s). 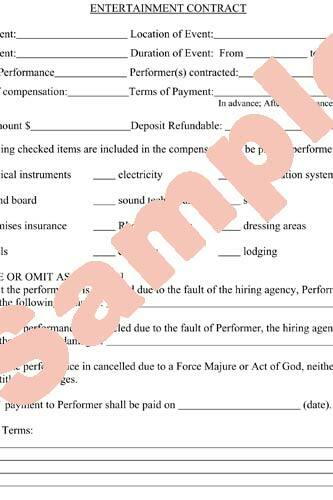 This form contains terms deliniating the Performer as an Independant Contractor, who must provide for his or her own insurance, indemnify loss, and who's maximum damages are the wages to be paid to him/her/them after a successful performance. This is a fully modifiable Physical Contact Agreement. This Agreement is entered into by the below ascribed parties to ensure written ratification of verbal statements to ensure that there is no misunderstanding about approved physical contact between the below ascribed parties. Landlords.....never rent to a Tenant without verifying their employment. This is a modifiable employment verification form used by Landlords to verify employment of prospective Tenants. It contains a release and signature authorization for the employee. Have the Tenant sign the authorization then fax it to his or her employer to verify their employment length, hours, wage, overtime, bonuses, and standing with the employer. Landlords use this modifiable form to obtain credit history and prior rental information from prospective tenants BEFORE even thinking about renting a property. 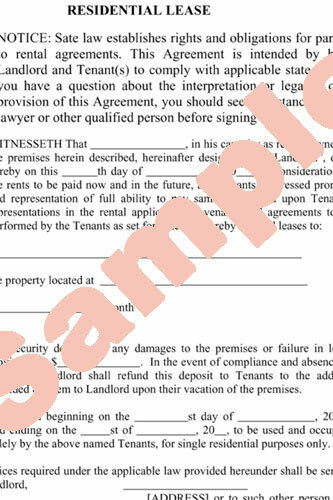 Landlords use a Rental Application Form to obtain relevant information and paying tenants expect them from Landlords that know their rights. 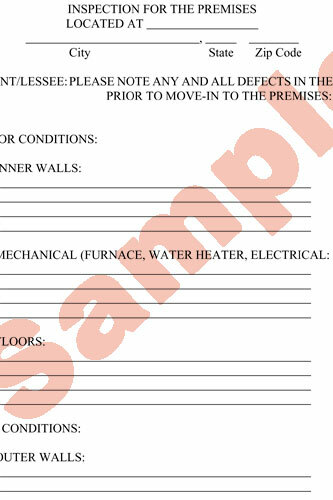 Landlords and Tenants use this Property Inspection Inventory form to document the move-in condition of the property. Like renting a car, the lessee (Tenant) must note any deficiencies in the property, and the lessor (Landlord) must note the good condition of all aspects of the property in order to claim any damages to be charged to the Tenant, and to deduct from the Tenant's security deposit. Landlords must use a move-in and a move-out Property Inspection Inventory denoting all damages claimed by the Landlord and charges being assessed against the Tenant's security, and sent to the Tenant at his or her reported new address. Landlords..........Never rent to anyone without obtaining a Consumer Credit Report from each Tenant. 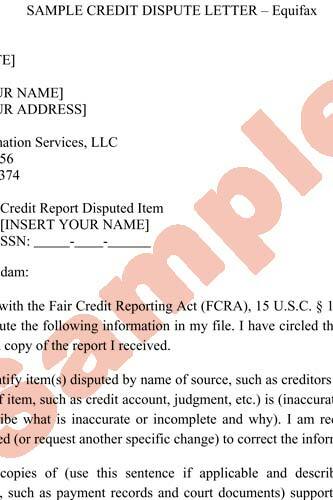 This Authorization to Obtain Credit Information contains questions of all necessary information and a release to allow you to obtain a Consumer Credit Report or verify financial information and should be completed by each prospective Tenant. Landlords.........use this form to ensure Tenants understand their duty to provide their new address after move-out to receive the closing Property Inspection and damage report. 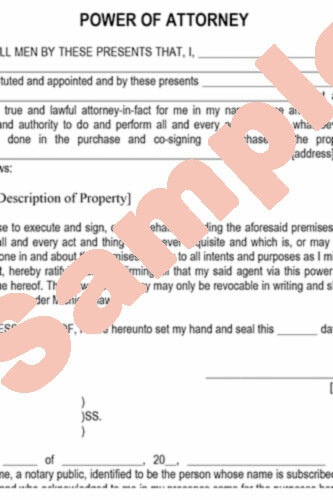 This form contains all necessary information to ensure the Tenant is appraised of the duty to provide their new mailing address and a signature acknowledgment of receipt of the form. 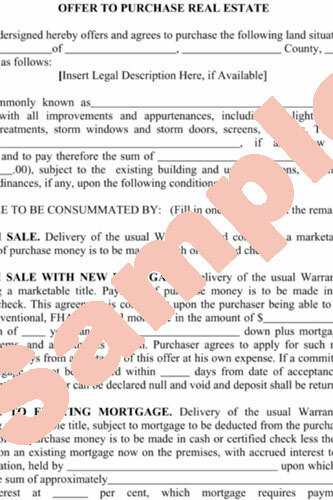 This Residential Lease Agreement Form has been used to rent property between Landlord and Tenants and spells out the terms of a residential lease between a Landlord and a Tenant, the description of the premises rented, the amount of rent, the late fees and penalties, the amount of the security deposit and what constitutes default and the damages for any breach of the lease agreement. It can be modified and filled in to your individual use and additional terms added. Tenants..... want to buy the property from the Landlord? Landlords... want to sell the rental property to the Tenant? 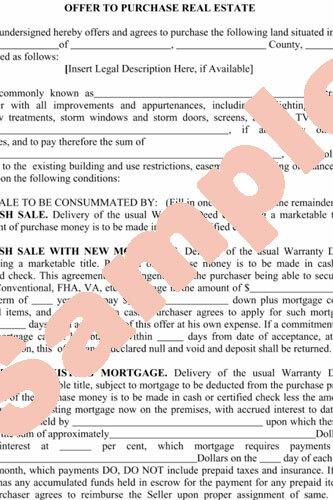 This OPTION TO PURCHASE form has been used to convey an option for sale from the seller (Landlord) to the buyer (Tenant). This arrangment allows the Tenant to secure financing while renting the property. Modify it to your individual use and get it done. This OFFER TO PURCHASE form can be used to make an offer to purchase real estate made from a buyer to a seller providing for the involvement of a broker. 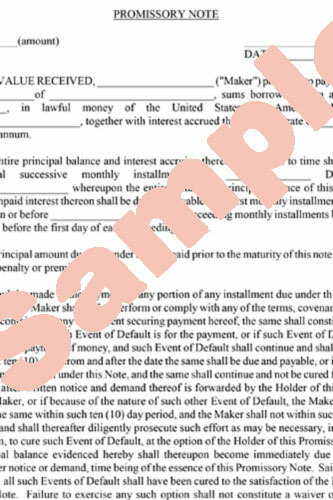 The form is simiple and straightforward and requires the Purchaser(s) to make the offer and deposit, the Seller(s) to acknowledge the deposit, for the Seller(s) to accept the offer and apply the deposit to the sale, and for the Purchaser(s) to acknowledge receipt of the Seller's acceptance. 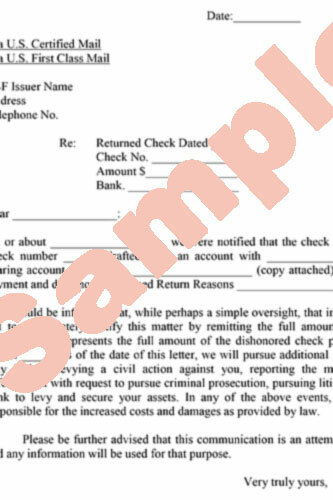 This form includes terms to pay for the broker's services. If you are not using a broker, please review the Offer to Purchase WITHOUT a Broker form. This OFFER TO PURCHASE form can be used to make an offer to purchase real estate made from a buyer to a seller without using a broker. 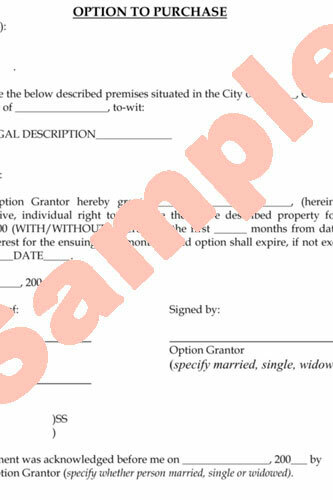 The form is simiple and straightforward and requires the Purchaser(s) to make the offer and deposit, the Seller(s) to acknowledge the deposit, for the Seller(s) to accept the offer and apply the deposit to the sale, and for the Purchaser(s) to acknowledge receipt of the Seller's acceptance. This form does not include terms for when you are using a broker. If you are using a broker, please review the Offer to Purchase with Broker form. 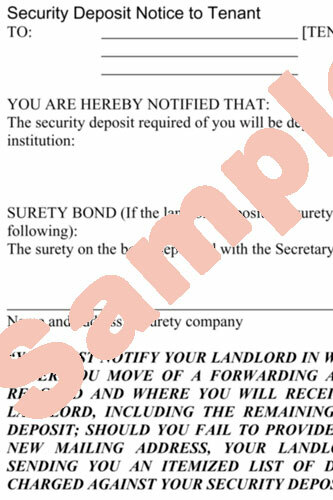 This modifiable mortgage form has been used to secure promissory notes for loans. Modify as needed to be recorded with county register of deeds to attach of record to real property. Beware of state usury (anti-loansharking) laws for any interest rate or repayment terms that and consult an attorney and/or title company for assistance. 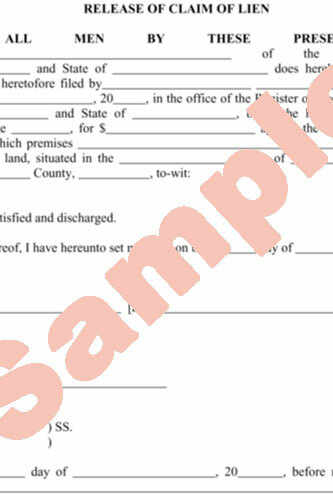 This is a modifiable QUIT CLAIM DEED form used to convey interest in real property from one person to another. It can be used to convey interest for individuals or mutiple parties. 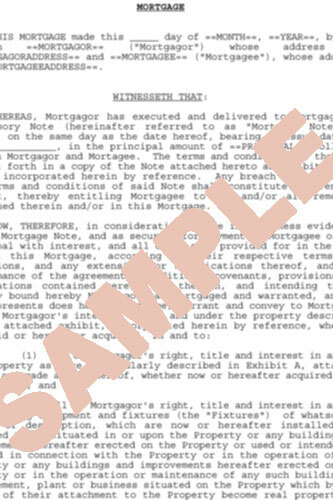 A quit claim deed is often used to terminate a contingent interest in property, such as when two brothers inherit a house and one sells out his interest to the other. The paying brother issues the recipient brother a quit claim deed and receives a sum of cash. The buyout brother records the deed and thereby terminates (quit claims) the bought-out parties interest in the property. 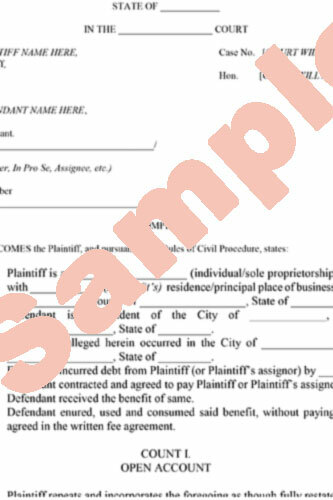 This QUIT CLAIM DEED form has been successfully used by investors who use it to acquire the interest of homeowners losing their home to foreclosure who transfer via the instant QUIT CLAIM DEED the homeowners' "right to redeem" the property. The investor then either pays off or negotiates a new loan with the bank and acquires the property. Do you want to buy or sell an OPTION to buy a property to/from someone? Is your Landlord willing to sell you the house you've rented from him or her for many years? An Option to Purchase may make your dreams come true. If you can negotiate the sales price and secure an Option to Purchase, you are half way there. This Option to Purchase form has been used to convey the right to buy property from an "Option Grantor" to the buyer ("Option Grantee") but does not bind or obligate the Option Grantee to complete the sale or actually buy the property. Instead, the buyer (Option Grantee) has OPTION to buy the property. The OPTION TO PURCHASE form is modifiable to suit your individual circumstances. Does anyone have a lien on your property? Are you buying a property from someone and want to clear liens held by others? In this form, the lien holder releases the lien by notarized signature. 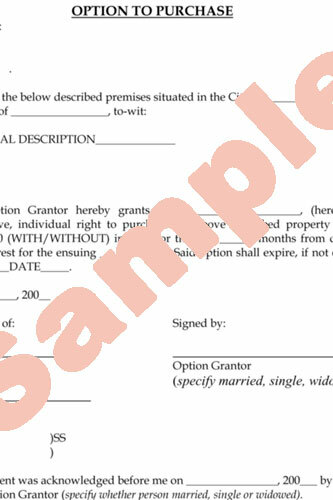 Use this form to clear liens on real estate. Take a notary with you and get that signature. 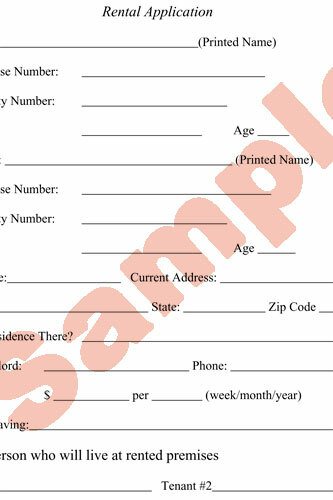 This form is simply, straightforward and easy to modify and use to your specific purpose. Unwary parties often get burned substantially when doing any renovation or building project by not ensuring an absence of liens, even when they pay all contractors and subcontractors in full. This form is a FULL UNCONDITIONAL LIEN WAIVER, used to ensure that any Contracror, Subcontractor, Repairmen, or Tradesmen either does not file a lien or that any lien filed is "released" via the "lien waiver". 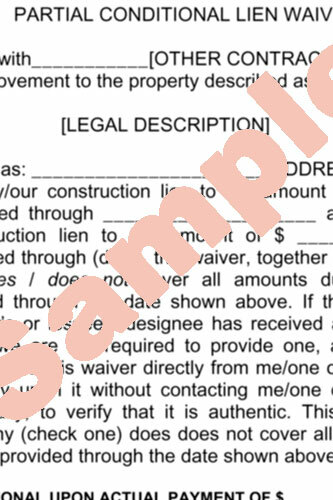 Be sure each Contractor signs the Lien Waiver for every job that is done. If the job is started and delayed or not to be paid until completed, use a partial conditional lien waiver form when the contractor stops working on the project. Have one signed and returned, minimally, when every performance check is written. 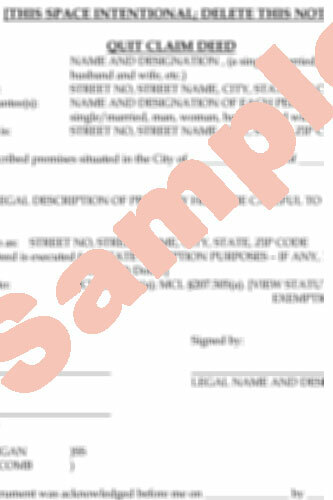 Religiously get signatures on these forms to prevent liens from being recorded by unscrupulous contractors. Subcontractors, Contractors, Property Owners and Project Managers use this form to partially, yet unconditionally release lien rights as to subcontractors as jobs are partially completed and paid for the partially, but not fully completed. If you are a subcontractor or a contractor, you know the importance of these forms. If you are a subcontrator they get you paid. If you are a contractor, you use the form to state what is owed and to ensure the subcontractor finishes the job. 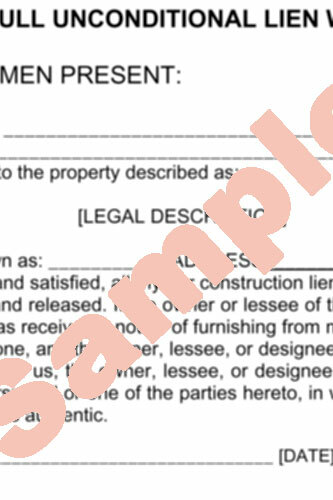 This form should be signed by every subcontractor every time a check is issued and an improvement is made to a property. When drains are put in, when basements are dug out by the excavators, when the cement is poured by the cement contractor, when the framers start to frame, etc. The forms says what is paid and what is due. Never pay a subcontractor without obtaining a written lien waiver. 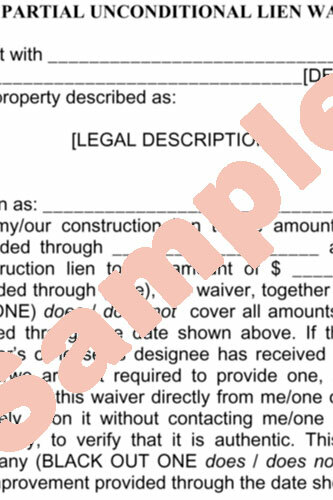 This Full Conditional Lien Waiver Forms is used by contractors, subcontractors and/or owners for a subcontractor to waive lien upon the condition that full payment is made to the subcontractor. Cautious owners, cotractors and project managers get these forms before the final payment is made to any subcontractor. Never, never, never, let a subcontractor have a final payment before all the necessary lien waivers are signed, and by the right persona. You can never be "too sure" when completing a construction project. 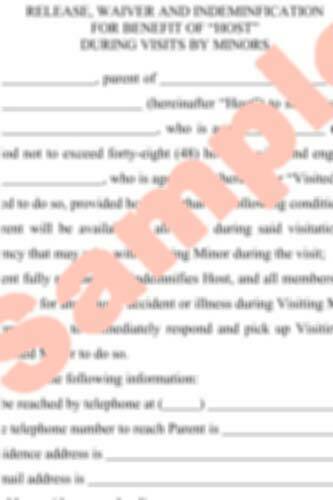 Be sure to get a lien waiver signed and be sure that an authorized person signs it. Subcontractors and Contractors use this form to partially release liens as job's subcontractors are paid, although the entire project, or when the subcontractor's job is not complete. 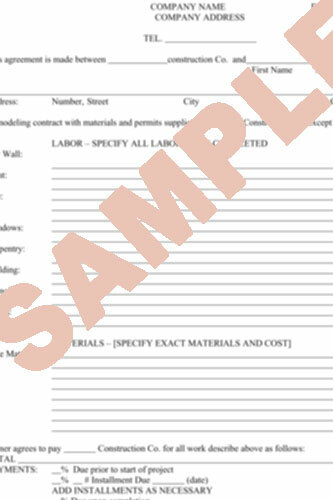 If you are a subcontractor or a contractor, you know the value of these forms. If you are a subcontrator who is not paid, you will be filing a lien to get paid. To waive liens, these forms must be signed off on every time an improvement is made to a property. When drains are put in, when basements are dug out by the excavators, when the cement is poured by the cement contractor, when the framers start to frame, etc. The forms says what is paid and what is due. They should be used in any building project involving contractors. A promissory note is an unconditional promise in writing made by one person to another signed by the maker, engaging to pay, on demand or at a fixed or determinable future time, a sum certain in money, to, or to the order of, a specified person or to bearer. 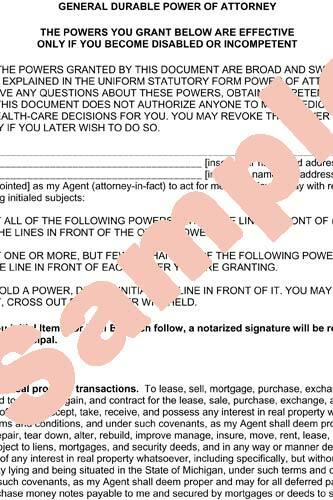 A power of attorney for real estate is a simple legal document that allows you to give someone the authority to buy or sell real estate for you, or to conduct any other business involving real estate that you own. Non-sufficient funds (NSF) checks cost practices time and money. A NSF check (also called a bad check, a bounced check, or a returned check) is one that a patient gives you, you deposit and the bank returns to you because the account is closed or does not have sufficient funds to cover the check. A written NSF check protocol ensures that staff can process the check and collect the money owed in a businesslike manner, spending a minimum of time and money. 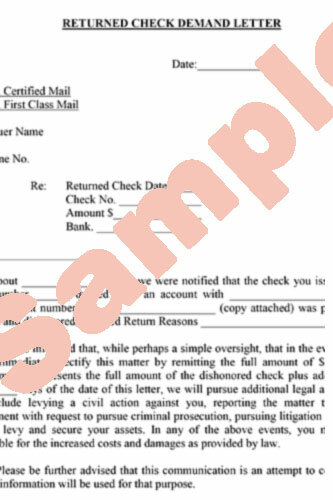 A Demand letter is sent by certified mail to demand payment or some other action, which is in default. Essentially, a demand letter sets out why the payment or action is being claimed, how it should be carried out (e.g. payment in full, payment over time), and directions for the reply and a deadline for the reply. Demand letters are frequently used to maintain some goodwill between business parties and they often encourage payment, in order to avoid expensive litigation. Most demand letters contain the "threat" that if it is not adhered to, the next communication between the parties will be through a formal legal proceeding. Ever watch anyone elses kids? What do you do with your kids when you go on vacation? 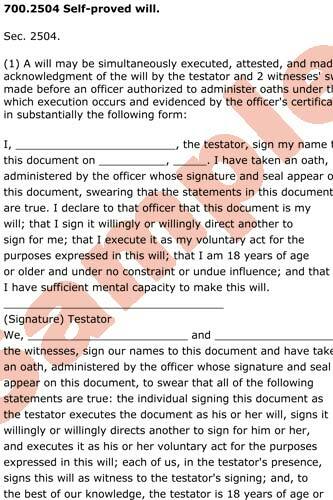 Have you ever been asked to sign a form by anyone who watches your kids, in case something happens? What does the host do when your child breaks an arm, needs stitches, gets in a car accident, has stomach pains, starts vomiting. You want them to take your child to the hospital, right? What happens when they can't reach you. 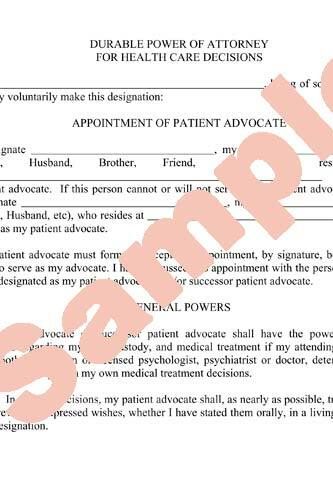 This is a form providing for consent, temporary guardianship and authorizing medical treatment. Change it, modify it, but for God's sake, never take anyone elses kids or give your kids to anyone else without getting things set up in writing in advance in case, God forbid, something happens while you can't be contacted. 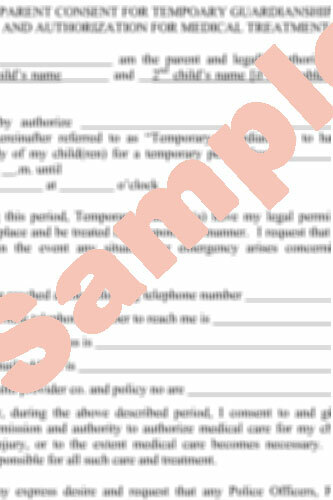 This is a Temporary Guardianship Agreement Form for persons who "temporarily" have your kid(s). It provides for a specific period and provides your permission for the period. Never take someone elses kids without one of these. Never leave your kids without completing one of these. So, your child wants wants the neighbor kid to spend the night. His parents are "all too eager" to drop him off at your house and say "bye". HOLD ON ONE SECOND. Don't you have direct/automatic, and unlimited liability? Are these parent's gonna find some reason to sue you and hit big? Johnny runs and falls and it's your fault. Johnny puts a pin in the wall outlet and it's your fault. Don't take little Johnny in unless you have terms ironed out in advance. This form is a modifiable release, waiver and indemnification form purporting to release the "Host" parties from liability. Never take in a minor without some form of a release agreement, and direct contact and insurance information from the parent. 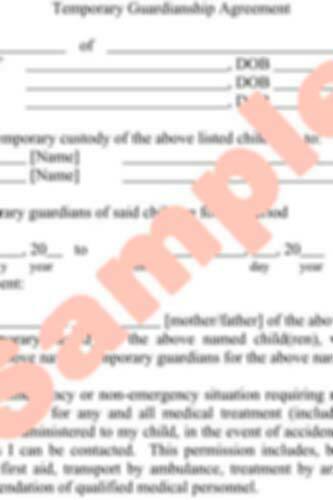 This form provides blanks for the contact information and terms to protect the "Host" parent. This is Michigan's Free Form of acceptable Will to avoid Intestate succession. It is written by the Michigan Legislature, meets all of the statutory criterion for an acceptable Will, and is set forth in a Michigan Statute. For use in providing authority to a trusted person with legal power to handle your affairs. For use to designate a "Patient Advocate" to assist in medical care decisions. 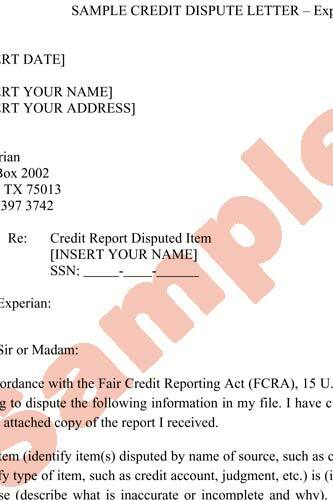 You have the right to be told if information in your credit file has been used against you. This includes whenever your credit report is accessed to deny your application for credit, insurance, or employment. The Credit Reporting Agency must tell you, and must give you the name, address, and phone number of the agency that provided the information. In addition, consumers are entitled to one free disclosure from each Credit Reporting Agency every 12 months upon request. See Request Free Consumer Credit Report for additional information. You have the right to know what is in your file and can request such information for free. In addition, consumers are entitled to one free disclosure from each Credit Reporting Agency every 12 months upon request. In many cases, the disclosure will be free if you meet certain requirements. Here is the link to the "FREE" annual credit report request site. 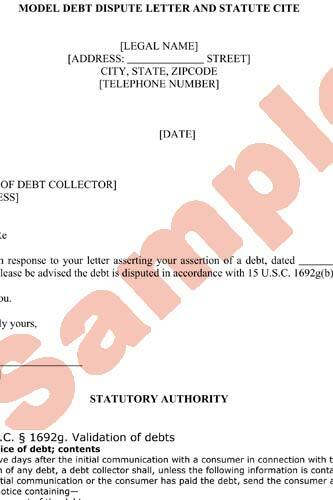 This is a modifiable form letter used to dispute the validity of a debt with a collection agency or debt collector averting "presumed validity" of a debt by the collection agency or creditor. This law then requires a debt collector to "cease collection of the debt, or any disputed portion thereof until the debt collector obtains verification of the debt or a copy of the judgment", after debt if disputed by the debtor within the 30 day notice period, sanctioned by the Fair Debt Collection Practices Act, section, 15 U.S.C. 1629g(b). You have the right to be told information in your file that has been used against you. This includes whenever your credit report is accessed to deny your application for credit, insurance, or employment. The Credit Reporting Agency must give you the name, address, and phone number of the agency that provided the information. You have the right to know what is in your file and can request such information. In addition, consumers are entitled to one free disclosure from each Credit Reporting Agency every 12 months upon request. 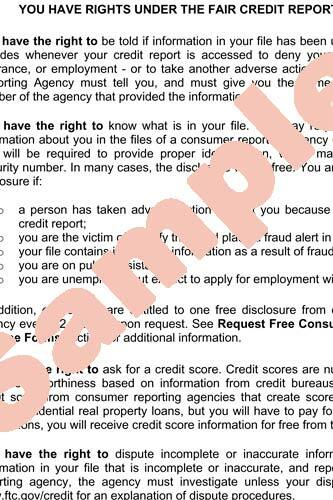 See Request Free Consumer Credit Report in the Free Forms section for additional information. In many cases, the disclosure will be free if you meet certain requirements. For more information, please visit www.ftc.gov/credit. This is an U.S. Department of Housing for Urban Development (H.U.D.) 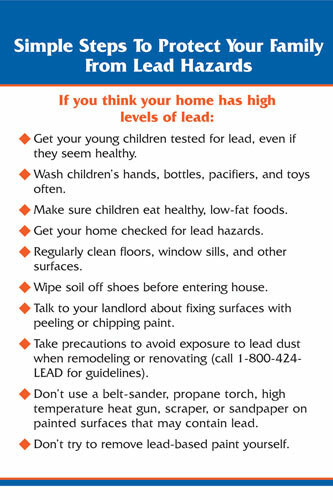 OFFICIAL Lead Based Paint Brochure cautioning home buyers and renters of the dangers of Lead Based Paint. This Brochure is widely publicised by the H.U.D. and it is an industry-wide standard mandated by federal law. All Landlords, Brokers, and Home Sellers MUST use it in conjunction with any home sale, rental, or transaction of any property sold with intent to be used as a dwelling constructed before 1978. 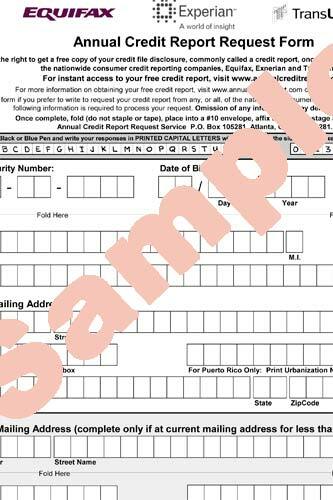 This form can be downloaded free of charge. It is our hope that all people, especially those with young children, understand and acknowledge the dangers of Lead Based Paint, as well as how to deal with those dangers if they arise. The United States Supreme Court has listed the "right to make and enforce contracts" among "those fundamental rights which are the essence of civil freedom." United States v Stanley, 109 US 3, 22; 3 S Ct 18; 27 L Ed 835 (1883). We "respect the freedom of individuals freely to arrange their affairs via contract" by upholding the "fundamental tenet of our jurisprudence . . . that unambiguous contracts are not open to judicial construction and must be enforced as written," unless a contractual provision "would violate law or public policy." Rory v Continental Ins Co, 473 Mich 457, 468, 470; 703 NW2d 23 (2005) (emphasis in original). Disclaimer. The information and documents referenced on this website are not legal advice, and are for informational purposes only. This site conveys basic legal forms which are examples of contract types. There is no substitute for sound legal advice and you should seek this from a licensed professional in your area and cannot rely upon any information contained in this site to substitute for same. No warranty for intended use is conveyed or implied, and, as the forms are fully modifiable by you, the end-user they should be tailored to your particular terms and use and you agree that Form Contract Corporation will not be liable for any particular use of any form or inclusion or exclusion of any term or condition.